The AADA supports the Federal Government in its issue of a compulsory recall notice for all motor vehicles fitted with a faulty Takata airbag. The AADA does not support the outsourcing of this recall to the independent repair sector. On 28 February 2018, the then Assistant Minister to the Federal Treasurer, the Hon Michael Sukkar, issued a compulsory recall notice for all vehicles fitted with faulty Takata airbags. The compulsory recall notice specifies a timetable for rectification, and refunds to consumers where replacement does not occur within a specified period of time and alternative transportation acceptable to an affected consumer is not provided. In addition, the notice requires OEMs to take a range of steps to locate the owners of affected vehicles, consumer communications, record keeping requirements, dispute resolution processes and salvage plans. Both South Australia and Tasmania have indicated that un-rectified vehicles containing Alpha airbags will have their registration suspended and be ineligible for re-registration. Other States and Territories and likely to follow suit. Sources from within the automotive aftermarket sector have suggested that independent repairers be allowed to perform Takata airbag replacements. The AADA does not support the outsourcing of this recall to the independent repair sector. 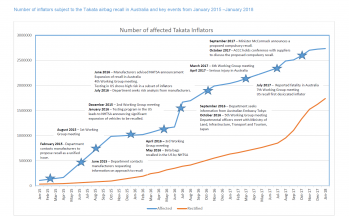 A similar idea was formally considered by the NSW Government in 2017, when a consultation process looked at introducing a temporary licensing exemption to allow repair workers who do not hold the required qualification to remove and replace Takata airbags. After an extensive consultation process with key stakeholders, the responsible Minister agreed “not to pursue such a regulation on the basis that it would be unlikely to significantly assist in the management of the recall and may introduce safety risks for consumers or repairers”. The Takata recall is the world’s largest ever vehicle safety recall and requires highly trained and qualified technicians employed by businesses familiar with strict recall processes and procedures. Recall work has been a core function of franchised new car dealerships for many years and our members have already rectified 1.7 million Takata affected vehicles. Dealers have also invested in systems which report the progress of recalls back to their manufacturing partners, a capability which will be very important with the increased reporting required of OEMs under the mandatory recall. This recall is somewhat unique in that the parts can be volatile and dangerous, and airbags need to be transported, stored and disposed of in line with dangerous goods regulations. Technicians may also require specialised OEM provided training and all Dealer technicians performing airbag replacements are trained and qualified, which will give consumers peace of mind, given only two states in the Commonwealth (NSW and WA) require motor vehicle mechanics to be qualified. The AADA believes that the franchised new car Dealers are best placed to conduct this recall safely and would urge against any proposals requiring independent repairers to be involved in this recall. Consumers may be confused if the government were to add another layer of ‘repairers’ into the recall process, and independent repairers who have no relationship with manufacturers would need to satisfy them that replacement of airbags is carried out to a standard that does not leave manufacturers exposed to litigation. This issue should not be conflated with the separate issue of access to service and repair information, as with recalls we are not competing with independent repairers for a paying customer. Vehicle manufacturers are responsible for managing this recall and using their Dealer networks is the most efficient and safest way of achieving this.